Juniper (Juniperus spp. ), a type of coniferous evergreen plant, has attractive needle-like foliage that ranges in color from lovely silver-blue to deep, intense green. With varieties hardy from U.S. Department of Agriculture plant hardiness zones 2 through 9, this versatile, drought-tolerant plant enhances landscapes and gardens as a stately tree, a medium-sized filler shrub and even as a creeping, low-lying ground cover. 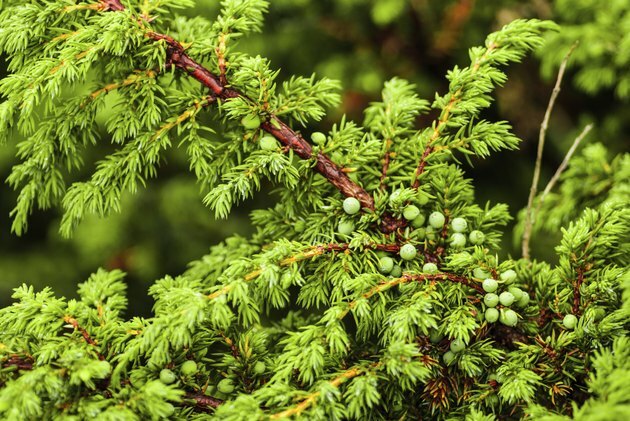 With the right care and planting techniques, you can prevent juniper bushes from turning brown and unsightly. With vigilance and prompt action, you may be able to stop any browning that has begun. Healthy junipers have distinctive evergreen foliage. Plant juniper bushes in a site where soil drains well. Soggy roots and excessive moisture make these plants susceptible to fungal diseases which can cause browning of foliage. Space juniper bushes far enough apart to prevent overcrowding and the increased risk of fungal disease that comes with it. A good rule of thumb is to plant them so their distance from each other equals the width you expect each plant to become when mature. Check juniper bushes for bagworms, which can not only cause browning, but can kill the junipers as well. Look for whitish bags, about 2 inches long, hanging from the tips of branches. Pick the bags off and burn them; they contain the damaging bagworms. Spray junipers with ready-to-use bacillus thuringiensis, a natural bacterial insecticide, if you see caterpillars emerging in late spring and early summer. Wear safety goggles when spraying, and spray until the plant surfaces are completely wet. Repeat spraying every 10 days until midsummer. Examine juniper bushes at the beginning of July for webworms, small brown worms with red-brown stripes running lengthwise. Their webby-looking nests encase juniper leaves and cause browning and even death. Pick off the webs and worms and destroy them, and spray juniper foliage with ready-to-use bacillus thuringiensis weekly for three weeks in a row. Look for bright orange swellings on branches that indicate cedar apple rust fungus. This is only an issue if apple trees (Malus spp. ), hardy from USDA zones 2 through 8, grow nearby. This cause juniper tips to turn brown and die, but the bush itself usually survives. Prune out the orange galls using sharp bypass pruners. To prevent the spread of disease, sterilize the blades with household disinfectant before and after you prune. Check for blisters at needle bases and brown leaf tips that indicate the presence of the juniper midge, a small insect that preys on juniper. Spray bushes with ready-to-use insecticidal soap to kill mature midges and ready-to-use light horticultural oil in early spring to kill the eggs. When using either spray, all affected foliage must be completely wet with the spray. Spray foliage with pet repellent to discourage dogs from urinating on your juniper. Dog urine not only discolors foliage, it can kill branches. Low-growing juniper is particularly at risk. Wrap the stem bases of junipers with guards of 1/4-inch hardware cloth to discourage mice, which gnaw the bark off and cause increased risk of infection and disease. Cut into the heartwood of browning branches to see if your junipers have tip blight. Also called juniper twig blight or phomopsis, this serious fungal disease kills juniper branches and sometimes the whole bush. If the heartwood is black instead of a healthy red, remove affected twigs and branches with sterilized bypass pruners. Destroy the infected debris. Use an anti-desiccant spray to create a barrier on needles to help slow water loss and resultant browning. Spray foliage thoroughly after the first autumn frost, when temperatures are no lower than the mid-40 degree Fahrenheit range. Apply again in late winter or early spring during a thaw day. Take a sample of affected juniper foliage to your local state or county extension office for diagnosis if juniper bushes are turning brown and you can't determine the reason. What to Do for Cedar Trees That Appear to Be Browning?